12. Location. The Fairmont Banff Springs Hotel is a one-of-a-kind hotel in a truly breathtaking setting. It is spectacularly located in the Rocky Mountains, just above the Bow Falls, and within walking distance to downtown Banff. Magnificent views abound in every direction, including Sulphur Mountain, Cascade Mountain, Mount Rundle, and the Bow River valley. Taking a photo from Surprise Corner just isn't enough; you'll really want to stay here! 11. Ambience. 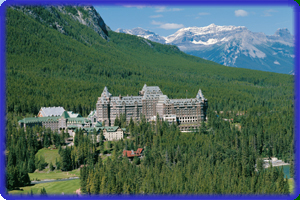 The Fairmont Banff Springs Hotel is magnificent, with a distinctive ambience of class. The hotel, built over a century ago by the Canadian Pacific Railway in a Scottish baronial style, helped launch the tourism boom for Banff National Park. Today, the hotel retains its historic elegance, while offering many modern amenities that make for a luxurious lodging experience, including swimming pool, fitness centre, a world-class spa, tennis courts, golf course, riding stables, exquisite shops, and ten restaurants and bars. High-speed Internet access is also available. 10. Food. The Banff Springs Hotel employs some of the best chefs in Canada, and they use only the best ingredients and the freshest produce in their culinary creations. While you will get more than enough to eat during WWW2007, you can also treat yourself to afternoon tea or an amazing Sunday brunch. It is all there for you! 9. Service. The Banff Springs Hotel is famous for its impeccable service. The hotel employs friendly, capable, and efficient staff, who are always willing to assist. Even better, no tipping of hotel staff is required (it is included in the room billing). Service with a smile is the standard here! 8. Price. The conference rate of $279 CDN per night (plus service charges and taxes) is a fabulous deal! This rate is 25-60% off the normal peak season rates for the hotel. By negotiating the WWW2007 contract well in advance, the WWW2007 organizers have been able to lock in the 2004 conference prices for both guest rooms and parking. 7. Discounts. The Fairmont Banff Springs Hotel is offering a 10% discount in all of the hotel's restaurants during the conference. This offer is valid for WWW2007 attendees (and traveling companions) who are staying at the conference hotel. 6. Membership Benefits. If you are not already a Fairmont President's Club member, you should join (free!) before you get to WWW2007. Not only will you earn points/miles during your stay, but you may also qualify for restaurant discounts, shopping discounts, booking privileges, and free fitness centre use. See the hotel Web site for more details. 5. Buddy System. If a room of your own just isn't possible, then you might consider sharing a hotel room for the week. Whether you are a graduate student with minimal travel funding, a company employee on a tight budget, or a committee member with strict per diem restrictions, there are likely others out there in the same situation. The WWW2007 organizers can match you up with a potential roommate at the conference hotel. By staying on site and sharing a room, you can soak up more of the total conference experience, and get to know another conference delegate well. The WWW2007 hotel buddy system is now ready if you need it. 4. Supporting WWW2007. The conference organizers considered site selection carefully, and truly believe that the Fairmont Banff Springs Hotel offers the best possible venue for the conference. In order to obtain meeting space and special concessions, the conference organizers must guarantee the number of room-nights occupied at the conference hotel. For example, if the room block pickup is 80% or more, then all WWW2007 meeting space is free for the entire week. Similarly, if the room pickup is 90% or more, then the in-room Wired Internet is free all week for WWW2007 attendees. If the guaranteed number is not met, then the conference must pay attrition charges and penalty fees to the hotel. Shortfalls in the room pickup will adversely affect the conference finances, and perhaps the WWW conference series. Staying at the conference hotel, even if only for a night or two, helps support the WWW2007 conference. 3. Convenience. WWW2007 has a chock-full program, and all of the technical sessions take place at the conference hotel. By staying at the conference hotel, you will have a better overall conference experience: easy access to events throughout the day, the option of returning to your room during breaks, relaxing at evening receptions, and lots of soft seating areas for networking with other attendees during the week. If you are staying off-site, the time spent traveling to and from the conference hotel may detract from your overall conference experience. The only offsite event for WWW2007 is the conference banquet on Thursday evening at Brewster's MountView Barbecue. For this event, bus transportation will be provided between the conference hotel and the banquet location. 2. Free Upgrade! The Fairmont Banff Springs Hotel is offering one complimentary room upgrade, to be assigned at random to a WWW2007 delegate upon check-in at the hotel. Imagine your joy (and that of your companion) if you are the lucky one upgraded to a signature room or suite. 1. Free Stay! The Fairmont Banff Springs Hotel is offering one free hotel stay, to be assigned at random to a WWW2007 delegate upon check-in at the hotel. One lucky winner will have free accommodation for the duration of his or her WWW2007 reservation. It could be you! Last modified: February 07 2007.